After earning her bachelor’s degree in design management from Arizona State University, Molly Moroney wasn’t sure what career path she wanted to pursue. The 21-year-old had an interest in marketing, so she decided to apply for Marketemy, LeadMD’s inaugural immersive, 12-week paid accelerator for digital marketers that launched in June. Moroney was one of three who graduated this week from the Marketemy program, and one of two hired by LeadMD to start their careers as marketing associates with the fast-growing Scottsdale-based marketing firm. The third graduate is still in school. Two recent Marketemy graduates Molly Moroney (left), and Samantha Lamb (right), with program lead, Alice Walker (middle). 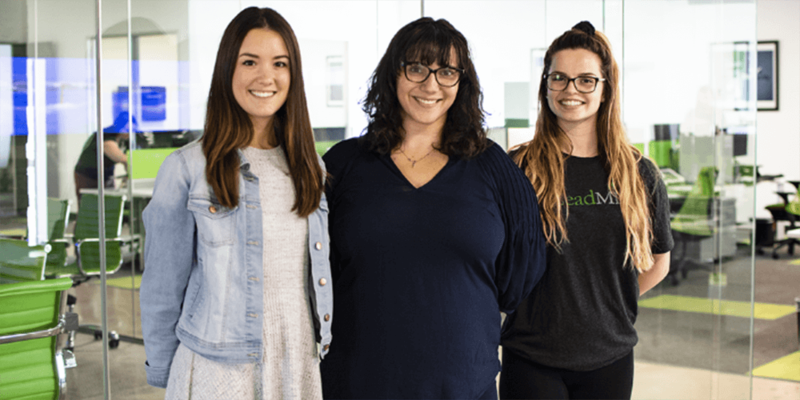 The Marketemy classes are taught at LeadMD’s office, which recently moved into a new, expanded office in Scottsdale as the company continues to hire new marketing consultants. LeadMD is planning to hire eight more consultants by year’s end. LeadMD spent four months and six figures gutting and designing in-house the building that was formerly an auto garage and deli, Gray said. The company moved from 6,000 square feet to 9,200 square feet because their lease expired and it wanted a more customized office and room to grow. Finding good employees has always been a challenge for LeadMD, so instead of standard recruiting or a typical internship, the company decided to create Marketemy to help interested employees kickstart their digital marketing careers. LeadMD is taking applications now until Sept. 1 for the next Marketemy course, planned to start in January. Local college/university seniors and new college graduates are invited to apply for the rigorous application process, said LeadMD CEO and founder Justin Gray. LeadMD Founder & CEO, Justin Gray shares more about Marketemy in the Phoenix Business Journal article, “Scottsdale Digital Marketing Firm Combats Talent Shortage with Hiring Accelerator.” Read the full article and see an office slideshow here.